Note: If you don't have a GoDaddy email address or would simply like to setup a forwarding account, please click here to see instructions. Login to your GoDaddy account management screen and click on the "My Account" link at the top left hand corner of the screen. Click on the "Email” block to expand the options. Find the email address you wish to forward to Reamaze and click "Launch". Check the email address and click on the dropdown menu to bring up the editing dialog box. Click on "Edit" to bring up the editing pop-out. In the pop-out, click on the "Show additional options" toggle to expand your view. Check the "Send copy of incoming email to:" box and type in your Reamaze mailbox address. Click "Save". Send yourself a test email to confirm forwarding. 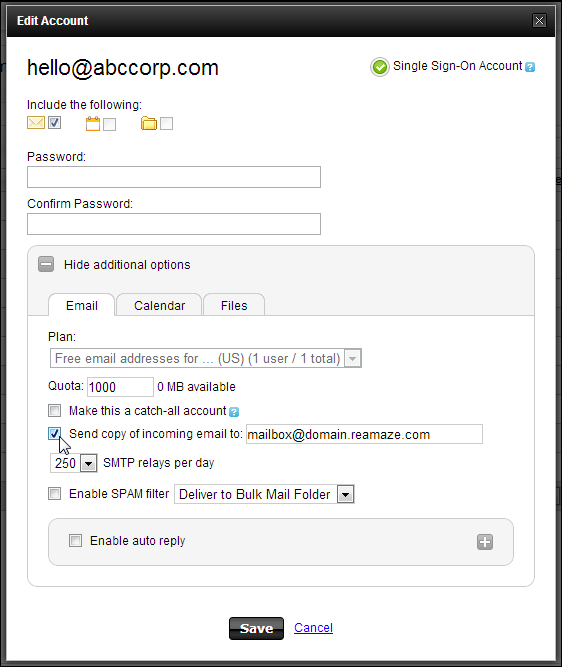 For example, we would email hello@abccorp.com an email and check to see if it gets forwarded to mailbox@domain.reamaze.com. Enjoy!